Trim excess fat. Place roasts in brine and soak in cool place (refrigerator if possible) for 12 - 16 hours. Remove from brine and rinse. Coat roasts in chopped garlic and coarse ground black pepper. Coat liberally with dry rub. Use the 2 cups of brine set aside to inject the roasts with a flavor injector. Let stand at room temperature 1.5 hours. Preheat smoker to 225 - 230 degrees. Cooking time is Approximately 5 hours. Remove from smoker when meat get to 145 degrees. let stand 30 to 45 minutes coved in foil to allow the juices to redistribute. This is a great time to put some beans & BBQ sauce in the smoker to warm. Sprinkle brown sugar on the beans. Stir both every 15 minutes. Slice roast and serve. Another tip.. Take one roast and thinly slice. Put in a crock pot with a bottle of Sweet bay rays BBQ sauce, a bottle of beer and all the crap trimmings from slicing the beef. You can add some garlic and onion as well. 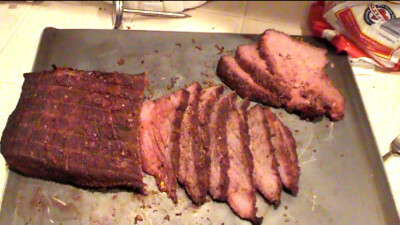 cook on low over night about 8 hours and you will have some of the best BBQ beef you have eaten. If you wish to freeze one of the roasts, do not cut into it. Wrap it in plastic wrap and foil and place it into the freezer. This will keep the meat juices in.